See also metropolitan areas of Mexico. This article contains lists of most populous cities as well as municipalities of Mexico. This is a list of cities in Mexico by fixed population, according to the 2010 Mexican national census. Note that Veracruz and Naucalpan are cities whose area is divided between two municipalities; the list gives the population of each part of the city separately. Note also that Mexico City contains all of the Federal District's area, including rural areas with relatively small populations. The Federal District's population, according to the localities in its boroughs, is 8,810,393 urban (99.54%) and 40,687 rural (0.46%). All other localities are officially classified as solely urban by the Instituto Nacional de Estadística y Geografía (INEGI). All of the map links are of the same scale. ‡ These cities extend beyond the borders of a single municipality. The following is a list of the most populous incorporated places in Mexico as of the 2010 census. As defined by the Mexico's Census Bureau the National Institute of Statistics and Geography (INEGI by its name in Spanish, Instituto Nacional de Estadística y Geografía). Note that this list refers only to the population of individual municipalities within their defined limits, which does not include other municipalities or unincorporated suburban areas within urban agglomerations. 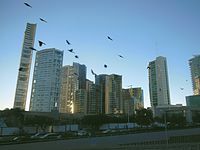 Wikimedia Commons has media related to Populated places in Mexico.